HOLLYWOOD SPY: MATTHEW GOODE JOINS 'THE CROWN' SEASON TWO AS LORD SNOWDON! 'THE 100' POST APOCALYPTIC SF SERIES SEASON FOUR POSTER IS HERE! MATTHEW GOODE JOINS 'THE CROWN' SEASON TWO AS LORD SNOWDON! 'THE 100' POST APOCALYPTIC SF SERIES SEASON FOUR POSTER IS HERE! Well, if you watched Netflix' ultra expensive and equally ambitious THE CROWN series, which also picked up a number of awards and nominations since it was aired last December, you will be happy to hear that Matthew Goode will join the cast of the second season of the series that follows the life of reigning British monarch Queen Elizabeth II. As 'Radio Times' has found out, Matthew will be playing the society photographer Lord Snowdon who was married to Princess Margaret in the 60s and the 70s. The second season will start from the 1956 Suez Crisis all the way to the mid 1960s. That will also be the last season in which Claire Foy plays the queen and Matt Smith her husband prince Philip, because from season three the whole cast will be changed and replaced with older actors in the later years of the queen's life. Returning in November, season two will focus more on the two men in the queen's life, prince Philip and their son Charles. 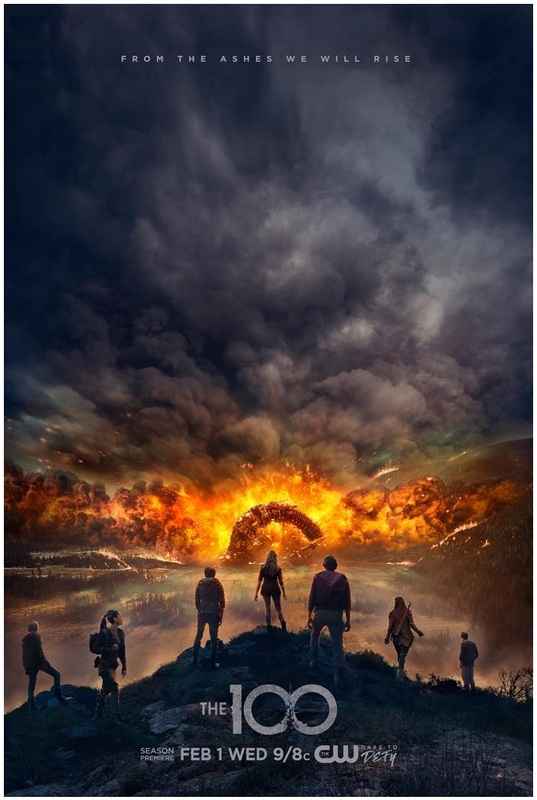 Speaking of the small screens, you can also check out the poster for the fourth season of post apocalyptic series THE 100 which will start its 13 episode run at CW from February 1st following the fate of the 100 delinquents sent down from their mothership to repopulate the Earth devastated after Nuclear disasters. Eliza Taylor, Bob Morley, Marie Avgeropoulos all return for the new season which will see half of the Sky People at Polis and half at Arkadia with the earth about to become 96% uninhabitable due to radiation in just six months which means they won't just have to fight each other but also the black rain and lack of resources. Matthew Goode will make a good Lord Snowden. Looks like him. I haven't started Crown either, nor the third season of Royals, but I'm downloading both and I see Royals are spicy this season, love me some Jasper and Liam! And the queen has a new toyboy! I can't say I like Prince Robert much this season, though Jasper and Liam do make up for my dislike of the character. The queen's new boy toy is awfully yummy! I am very much enjoying the 3rd season. I'm hoping to start watching it soon :) I'm currently covering BBC leftovers until THE 100 and REIGN start next month. I'm so over interest in whatever - past or present- British royalty. I was intrigued by the last post on KONG however. Why isn't Charlie Hunan staring in that? Not that I'm protesting Ewan; just wondering. Is it me or does that ridiculous white hat make Matt look perfect for joining the elite? Of course The Crown got a next season. Netflix loves showing those awards in their detractors faces...and count their money. Need to watch The 100 from scratch. To Netflix! You might actually like THE 100, especially since it is a YA adaptation! You know, we watched the first two seasons of The 100, and at the beginning of the 3rd, we just didn't like the direction it was going. Sad to say because we really, really liked the first season. Yes, when they let her commit a genocide and still stay the lead hero, they ruined it for me as well, it is an example of disgusting things US shows are teaching youngsters. Happy to see the next session of The 100..